Normal Mode, Thermal Mode, and Hair Mode. Users can treat various indications, achieving the optimal clinical outcome with a single system. 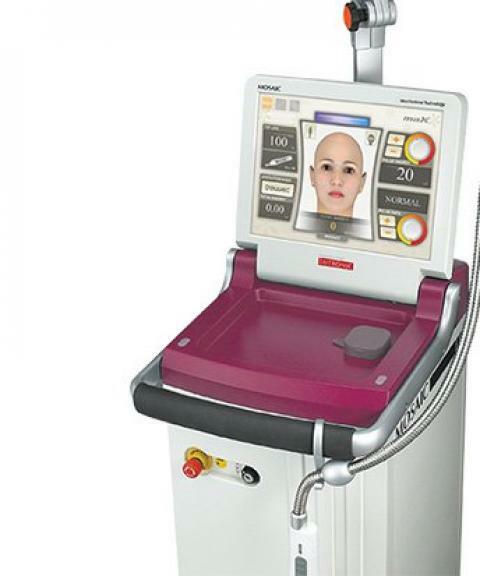 Although the MOSAIC HP laser system causes micro thermal damage in the skin consisting of controlled necrosis and coagulation, skin renewal is stimulated via the rapid wound repair and remodeling response initiated by the surrounding normal tissues. The MOSAIC HP is completely nonablative, meaning that no epidermal tissue is vaporized by our fractional approach. Animal study proves that MOSAIC HP enables hair regrowth through converting telogen phase into anagen phase. The advantage of Controlled Chaos Technology is that it randomly delivers each micro beam so a more natural, uniform treatment is achieved. MOSAIC HP raises the standard by offering a choice between two convenient and easy to use operation modes. Users can freely switch between the two modes during the same treatment session and treat very accurately regardless of the size of the treatment area.